Bacteria that are resistant to a class of powerful ‘last resort’ antibiotics – carbapenems – have been recently reported in a dog for the first time in the UK. In a study published in the Journal of Antimicrobial Chemotherapy, an Escherichia coli isolate cultured from a wound in a springer spaniel was found to harbour a known carbapenem resistance gene, along with resistance genes for other commonly-used antibiotics, such as cephalosporins. “Worldwide there are very few reports of carbapenem-resistant isolates in pets and although the prevalence identified in this study was low (0.5%), it was still surprising,” says Dr Dorina Timofte, who oversaw the study at the University of Liverpool’s Institute of Veterinary Science. The work, which was carried out in collaboration with the University of Oxford, studied bacterial isolates cultured from clinical specimens submitted to one UK diagnostic laboratory receiving specimens from 34 UK veterinary practices between September 2015 and December 2016. The researchers say that the ‘surprise’ finding highlights the need for routine laboratory detection of carbapenem resistance in companion animals isolates and improved antimicrobial stewardship in veterinary practice. 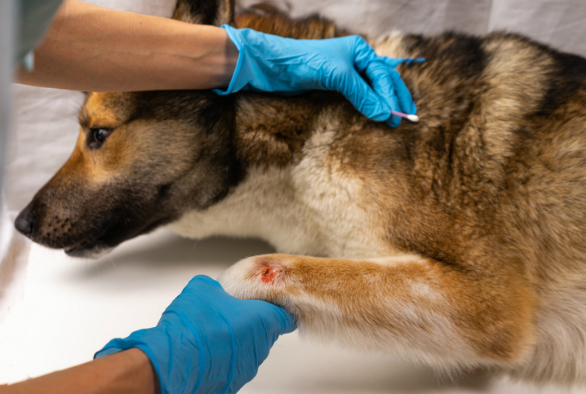 During the last two decades various multi-drug resistant pathogens, such as methicillin-resistant Staphylococcus aureus (MRSA), have been associated with carriage and disease in pets. Surveillance of resistance to commonly used veterinary antibiotics has grown, yet there is limited surveillance of resistance to ‘last resort’ antimicrobials like carbapenems, which means that this type of resistance can remain undetected. “Veterinary diagnostic laboratories play a major role in surveillance of antimicrobial resistance (AMR), monitoring trends of resistance and detecting new emerging patterns of resistance, yet at present screening for resistance to last resort antimicrobials is voluntary,” explains Dr Timofte. Both the WHO and UK strategies for tackling antimicrobial resistance have shown that there is a need for increased access to surveillance data as this can support help policy-makers to revise the recommendations for combating AMR. To tackle a current shortage of specialists in veterinary clinical microbiology, the University of Liverpool has established the first UK European College of Veterinary Microbiology residency training centre, which will train experts in veterinary clinical microbiology, including antimicrobial stewardship. More excellent work from Dorina Timofte. A real unsung hero in this university.